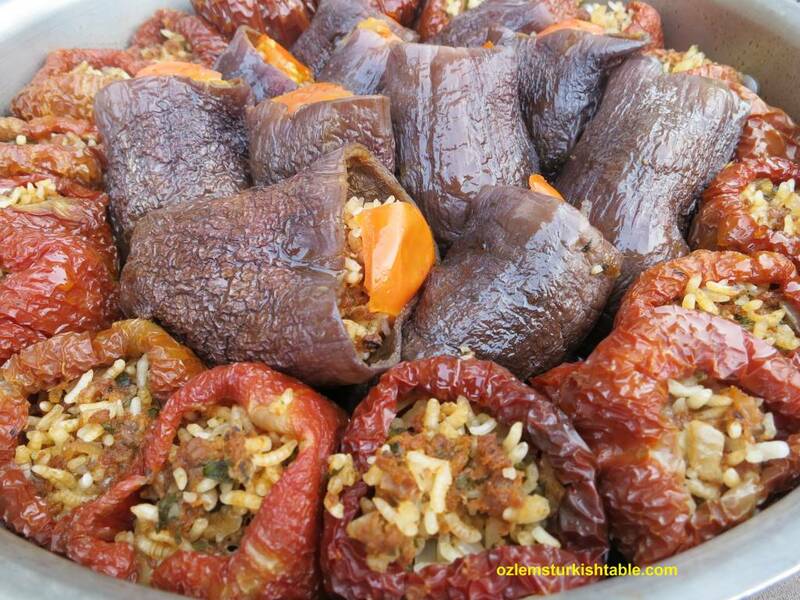 Have you ever had stuffed dried eggplants or peppers, kuru patlican ve biber dolmasi, in Turkey? 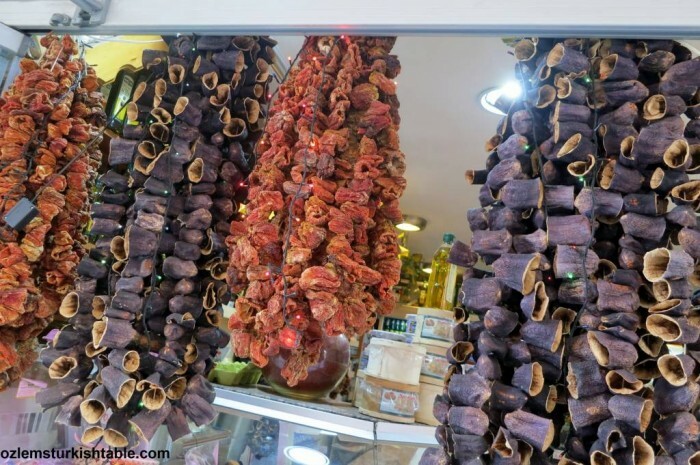 Or ever wondered what to do with those dried eggplants beautifully displayed hanging at food stores? You are in real treat if you can get hold of them, as not only they are wonderful as a decoration (and a talking point, as I use them at my Turkish cookery classes), these dried vegetables (actually fruits, as they have seeds in them) are also scrumptious when stuffed. 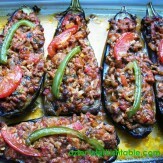 You are most likely served kuru patlican dolmasi, stuffed dried eggplants as a mezze at kebab houses in Turkey. You may also enjoy them at esnaf lokantalari, traditional, local Turkish restaurants, or specialty eateries like Ciya restaurant in Kadikoy, Istanbul, where they serve some of the best examples of Turkish regional cuisine. Dried eggplants and peppers at Turkish food stores in Istanbul. Turkish cuisine is based on seasonal, fresh produce and we as a country, are blessed with a wide variety of fruit and vegetables in every season. When eggplants and peppers (as well as baby okra and many others) are in abundance, some of the harvest is dried out to be used out of season. For instance, the fleshes of the eggplants (aubergines) are scooped out and the shells are tied together with a piece of string. These strings of eggplant shells are than dried out in the sun, accumulating a rich, concentrated flavor of the eggplants. You can buy these strings of dried eggplants and peppers at Turkish & Middle Eastern stores abroad. In order stuff the dried eggplants and peppers, you need to blanch them for 3 minutes in boiling water to rehydrate, until they start to soften up but still retain their bite. You then need to give them a “cold bath” in a pan of cold water, so that they retain their vibrant color and texture. As for the filling, I love the addition of fragrant dried mint, tangy pomegranate molasses and the rich pepper paste, biber salcasi (if you don’t have red pepper paste, you can add a delicious heat with red pepper flakes) to the stuffing mixture, as we do in southern Turkish cooking. They complement the dried eggplants and peppers beautifully, and the aromas take me right back to my hometown, Antakya. Bulgur can also be used instead of rice, as in Gaziantep cuisine and it is delicious. You can also omit the meat for a vegetarian course, and can add more onions and herbs to the filling. 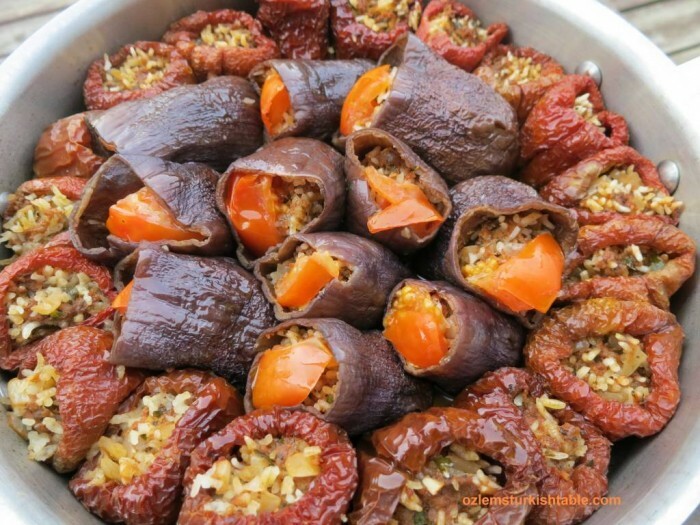 I hope you can get some of these dried peppers and eggplants and enjoy these delicious dolmas. They make a great food for entertaining, a real crowd pleaser – dolmas do disappear very quickly, so I advise making a few extra! 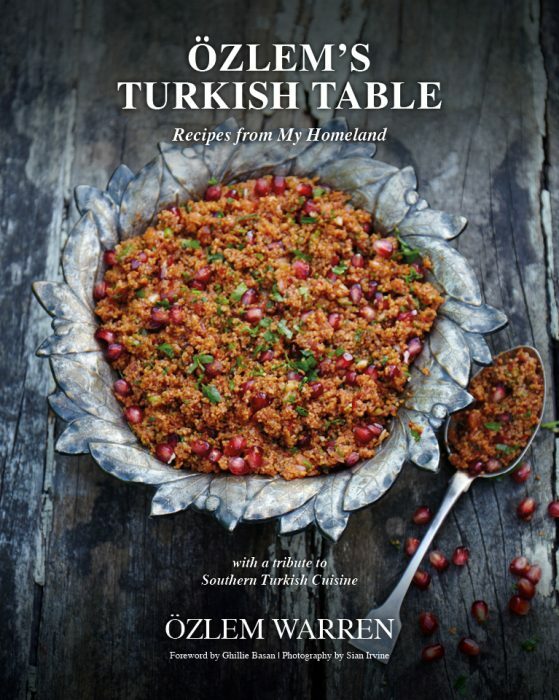 This recipe and many other delicious Turkish recipes included at my cookery book, Ozlem’s Turkish Table, Recipes from My Homeland, available to order at this link. I hope you enjoy these dried eggplants and peppers, stuffed with ground meat, aromatic rice, pomegranate molasses and spices, a Southern Turkish specialty. Afiyet Olsun! 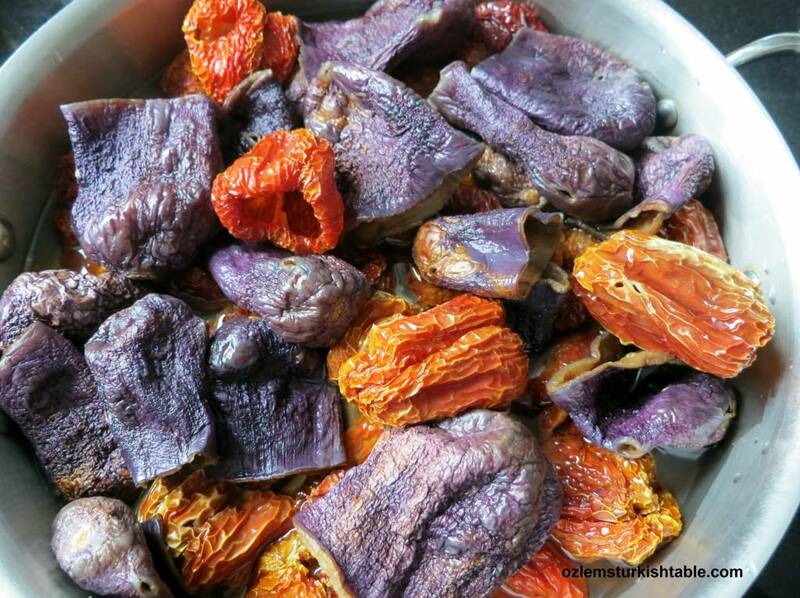 Cut the strings of the dried eggplants and peppers and place on a large pan of boiling water. Blanch them for 3 minutes to rehydrate. Afterwards, gently place them on another pan with cold water for 2 minutes, to give them a “cold bath”; this will help them to retain their color and texture and not to break apart. Then gently place the hydrated dried peppers and eggplants in a sieve/colander, ready to be stuffed. Place the onions, garlic, pepper paste (if using), tomato paste, parsley, 1 tbsp. olive oil and spices in a large bowl. Season with salt and black ground pepper to your taste. Knead this mixture with your hands for a minute, making sure all blended well (this stage also helps to soften the onions). Stir in the ground meat, rice and pomegranate molasses to the bowl and mix well. Filling is ready. Get a wide, heavy pan for cooking and pour in the 2 tbsp. olive oil (it would be ideal to place the stuffed peppers/eggplants side by side in one layer). Spoon the filling mixture carefully into each pepper and eggplant, pressing gently for the filling to settle in. Make sure to leave about 1cm (0.4”) space at top for the rice to cook and expand. You can seal the tops with a piece of tomato as a cap or you may press the edges together for a gentle close. Place them up right, side by side, packed tightly. Pour in about 2 cups of water (or a little less) over and around the stuffed peppers and eggplants. The water should cover half length of the stuffed vegetables. Bring the liquid to the boil then reduce heat, cover and cook gently for 30 – 35 minutes or until the filling is cooked. Serve hot with Turkish red pepper flakes sprinkled over them, if you like. Thick plain yoghurt with a little crushed garlic goes very well with these stuffed eggplants and peppers. Cacik dip of cucumber, yoghurt and mint would complement these dolmas very nicely too. You can use bulgur instead of rice. For a gluten-free option, you can use whole grain basmati rice. You can omit ground meat for a vegetarian option. I suggest including more onions and herbs instead with extra olive oil for the vegetarian option. 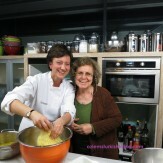 Özlem, Thanks so much for this delicious sounding recipe. You know, I’ve been eyeing those dried eggplants and peppers for years but I confess that up to now, I haven’t tried my hand at it. Now, you’ve given me the courage to try them. Really, the photo looks yummy. Teşekkür ederiz öpüyoruz. I love meat stuffed in vegetables and cooked, the juices come together so well. Got my eye on the lovely bell pepper version. Thanks Ozlem, for the simple directions:) xxPeri. Fantastic dolmas! Even though drying the veggies is also a tradition in Lebanon, it is not used much these days as fresh veggies are always available these days. One can see those at the Armenian stores though. I would love to try them some day, wonder if the flavor is more intense then with the fresh ones? I’ve never tried dried eggplants or peppers, but I think they sound like something I’d really enjoy. I’ll be on the lookout for them from now on. Hopefully they’re not too delicate to handle because I’m a fairly clumsy cook. 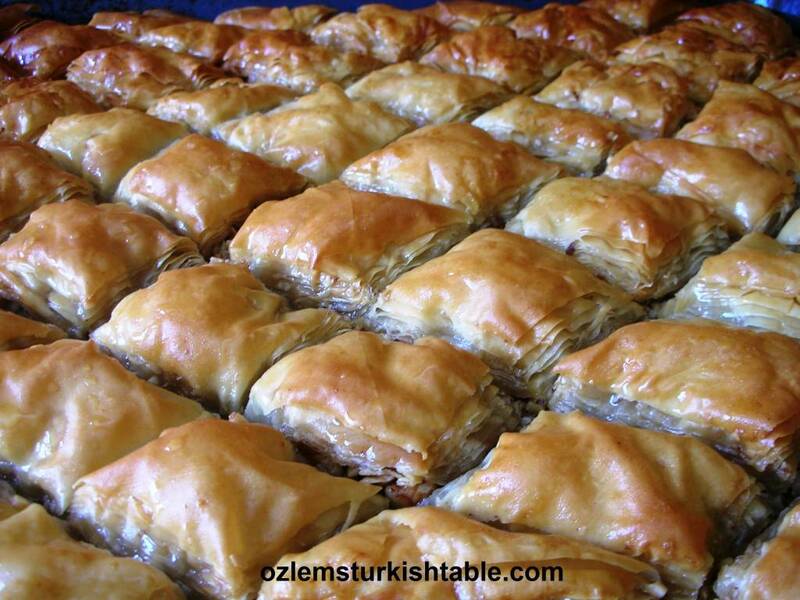 Hi Ozlem – love the recipie, thanks! My father in law keeps giving us the dried cases and finally I have a recipe to use them! Just a note – you dont mention what to do with the rice – My understanding is that you mix it with the meat in the filling, so that’s what I did. Also you dont mention what to do with the pomegfranite mollases – I got the bottle out of the fridge, but forgot to use it! I guess it goes in the filling also? 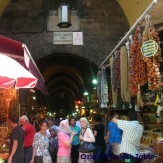 Hi Ozlem, it looks wonderful! Can you tell me what varieties of aubergine are used for drying? Can I do this with any type of eggplant? Or usually some are preferred to others? thank you for the article. Will you please be kind to provide me the contact details for one of these shops since Im searching to buy some quantity and ship to my country Jordan.